Major landmarks: Juan Luna Volunteer’s Fire Brigade near Ylaya and Juan Luna streets. Goods in stores: Kitchenware and glass containers; plastic containers for packing food and goods for resale; plastic and styro plates, cups and saucers; cream canisters for repacking ointments, potions and other beauty products; ingredients for flavored drinks and beverages (food coloring, powdered flavoring, and magic sugar). Goods on the street: Fresh vegetables like carrots, cabbage, beans, onions and ginger, packed vegetables (assorted); nuts and candied fruits; dried and fermented fish. Details worth noting: Heading east, this street takes you back to Juan Luna Street; It is also parallel to C.M. 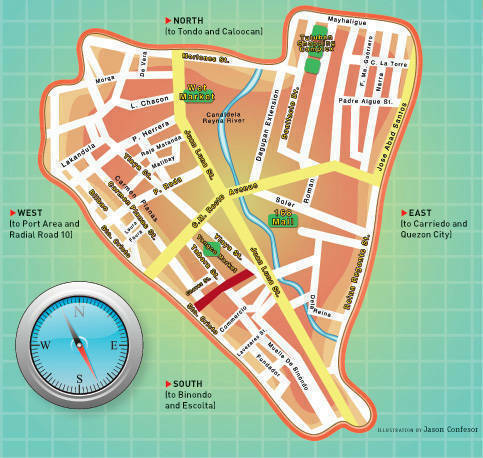 Recto to the north, just a block away, in case you get lost in the shuffle of Tabora, Ylaya and Sto. Cristo streets.